A mother’s work is never done. There’s always more laundry to fold, dishes to wash, stories to read, homework to check, faces to scrub, boo-boos to kiss, meals to prepare, after-school activities to attend…the list goes on and on. It’s no surprise that many of us are exhausted, overwhelmed, and sometimes feel like we’re failing. But how do we even begin to think about reducing stress? I’ve often been asked how I manage everything from raising four children to managing my own business and working full-time from home. My oldest has autism and I have my own set of health issues to contend with as well. The answer is simple: I don’t. None of us have an infinite amount of resources, whether it’s time, money, energy, or health. We each have limitations and we have to recognize and choose where to draw the line or the line will be drawn for us and not where we want it. This is the first step toward reducing stress. It took me a long time to realize that it was okay to say “no” and not feel guilty about it. That it was okay to not have every minute of every day scheduled with to-do lists and activities. I used to be stressed-out all the time, because I thought I had to do it all and when I couldn’t, I felt like a complete failure. At the same time, I was always behind and felt like I never did enough. That applied to everything from raising my children, cleaning my house, blogging and even friendships. About a year ago, I was just done with it all. I had one of those moments of recognizing the obvious and realized I didn’t have to keep fighting such a losing battle. I made some simple, yet important changes and since then, I do far less than I used to, but I accomplish more. The simple solution for reducing everyday stress and actually having time for what matters the most is prioritizing. We each have to decide what’s important and spend our time, energy, and resources accordingly. When we don’t prioritize what really matters, we end up wasting time with things that don’t fulfill us, cause frustration and even more stress! The first step to figuring out your priorities is to think about what’s important to you. Is it your children? Your spouse? Jesus? Work? Friends? Volunteering? A favorite hobby? You? Yes, YOU need to be on your list! Take some time to think and write down your priorities. You can always change or rearrange the order later. If you don’t love your handwriting (like me) and would rather type in your list, click here to download the JPG version, upload to PicMonkey, add your text, save, and print! Display your “Priorities” list somewhere you’ll see it often, so it will remind you of what’s important. My “Priorities” list is hanging near my desk where it’s often helped guide me back to what I really need to do. Instead of stressing over my dirty house, I’m reminded that it’s okay to go outside and enjoy the beautiful day with my children. Or instead of feeling guilty for running behind with work, I can recognize that I spent some much-needed time relaxing. This simple visual reminder of your priorities can be a huge help in reducing everyday stress and keeping the big picture in focus. Remember, we’re not supposed to do everything. We’re not even meant to do most things. Take some time to figure out what’s really important to you – you won’t regret it! You’ll have more time for what really matters and reduce stress too! Read more about prioritizing in my short book: Less Stress, More Joy. Get it for free here. I need to work on this badly this summer! This printable could help a lot. Priority lists make a big difference. I recently heard someone say ‘you do have time, IF it is a priority.’ Agreed. I’ve never felt guilty for saying no. My husband does though. You’ve got a great article here. We all need to reduce stress – I worry too much so that’s what I need to work on. What a great idea! I always feel like there aren’t enough hours in the day to get everything done. I want to spend quality time with my husband and kids, but then also want to work on my blog, and am heading back to my full time job in a couple weeks! I can’t possibly do it all, but love the idea of using this printable as a daily reminder of what’s important. Thanks! These are great tips for reducing stress. I really always have trouble saying no and I do feel so guilty when I do. It is something I have been working on. 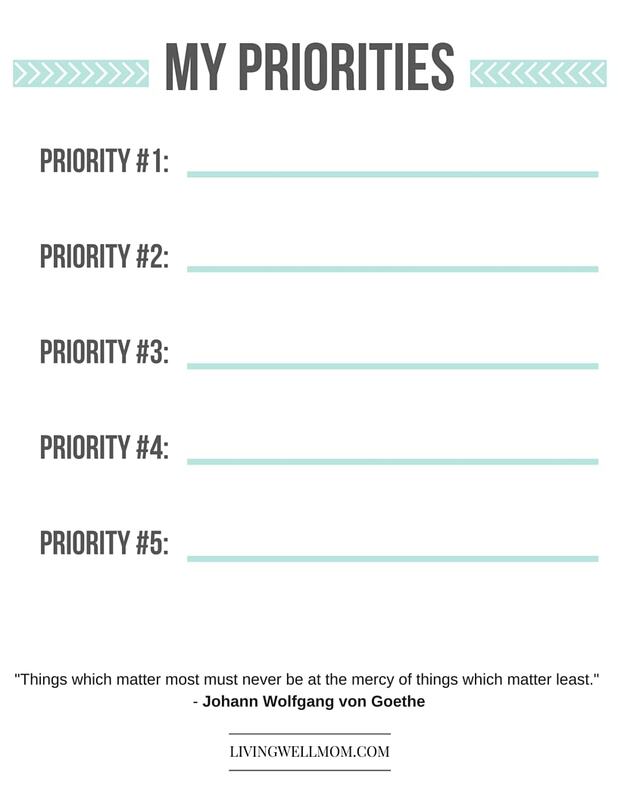 The priority list idea is indeed something I am going to start doing. Thanks for sharing the ideas. Never been a huge fan of self help methods like this one… Tried out journaling, setting goals etc. in the past but i kept finding it pretty hard to stay motivated and consistent. This look easy and like it requires less effort, might as well try it out!